It's a nice plugin. Works well. Would like to see a few more configurable options. 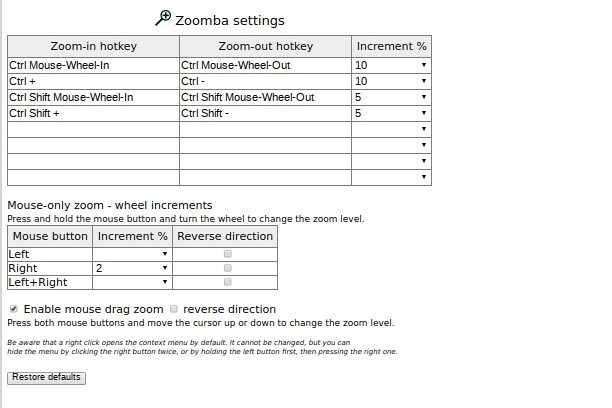 For example on multiple button mice give an option to single click a side button and then use the wheel to zoom in or out. Or single click the left button and then use the wheel to zoom in our out. Having to hold down the left or right button while trying to scroll the wheel can be tough. Would also like to see a way to quickly zoom back to 100%. Perhaps the plugin icon could have a reset to 100% option right next to it. Overall a good plugin. Just needs to tweaks to make it an excellent plugin. JIM HOPKINS likes this APP. Woohoo First!! !